What discussion of British royalty, such as our November editorial inspiration of Netflix’s The Crown, would be complete without a nod to that quintessentially British activity — afternoon tea. I am a great fan of the practice. 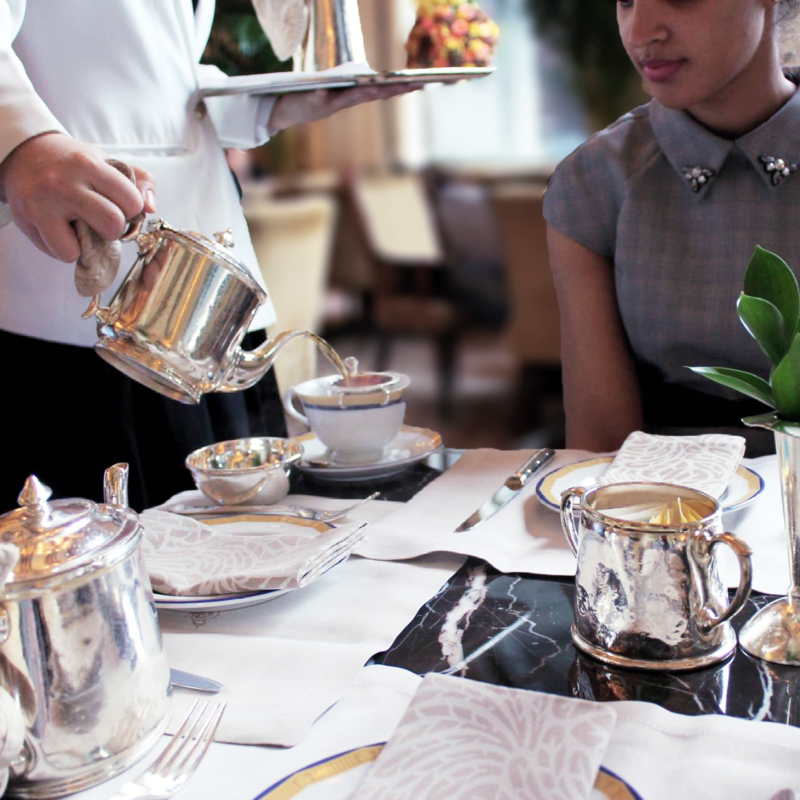 I fell in love with the idea of afternoon tea after trying afternoon tea at the Peninsula Hotel in Chicago. It was some time ago, but I recall being taken aback by the amount of food presented. I could barely finish everything, but I didn’t want to stop eating. Since that first experience, I’ve been lucky enough to try a variety of afternoon teas, including several in London. 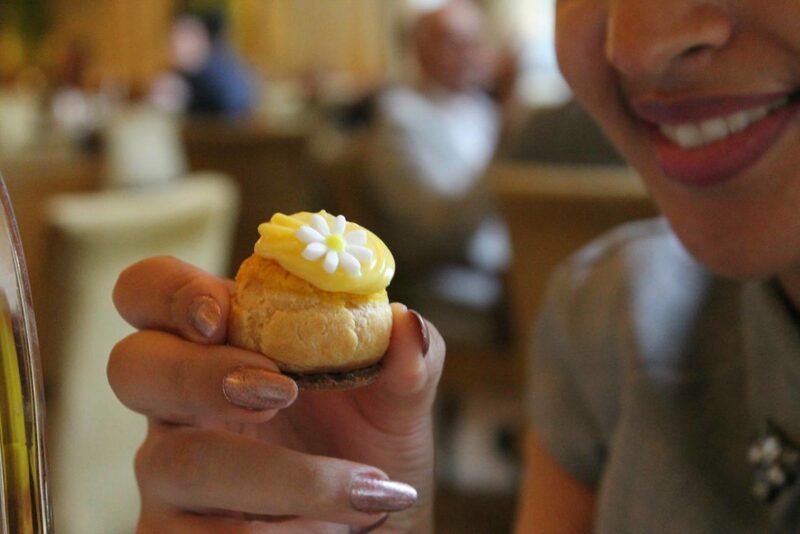 While afternoon tea isn’t something that you can afford to do every day, it certainly makes for a special treat. While afternoon tea is most closely associated with the British, any Hong Kong resident will tell you that afternoon tea is an integral part of Hong Kong culture with both traditional style tea and breakfast houses called cha chaan teng, and more British style afternoon teas, Hong Kong having been a British colony for 156 years, until 1997. 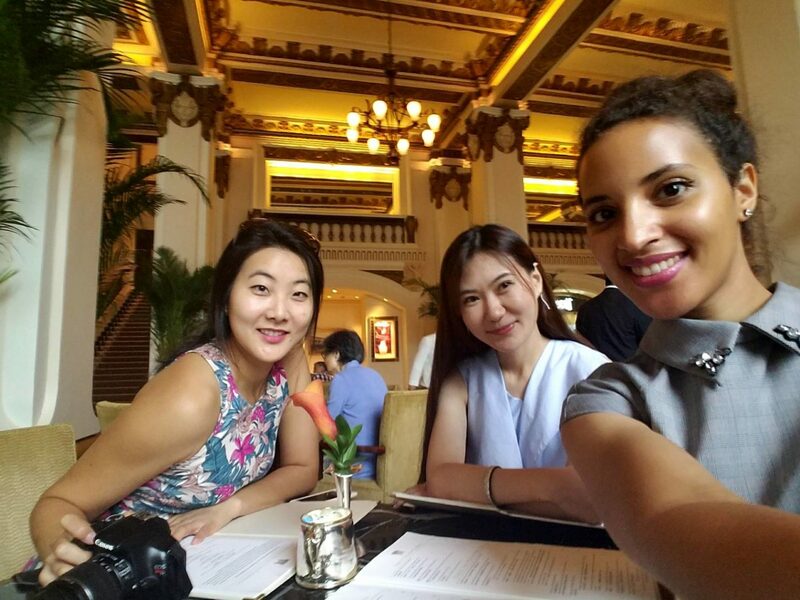 I have been anxious to try an afternoon tea in Hong Kong, so along with a couple of friends, I finally got the chance to partake of afternoon tea. We chose, where else, Peninsula Hotel. You can’t make reservations for the Peninsula’s afternoon tea, so be prepared. Instead, you must “queue up,” as the British say. We arrived an hour early, because I made a reservation thinking it was for tea, when it was for lunch. Luckily, my friends were good sports, and were willing to stand in line. Because we were so early, we were second on the list, and were amazed to see the line get longer and longer. Even by the time we had finished our tea a few hours later, there were still dozens of people lined up waiting. Afternoon tea is served it the Hotel’s lobby, which is awash in historical opulence, almost as if you were transported back to the 1920’s, if only hotel guests weren’t walking around in expensive track suits. Being in the lobby certainly made for great people watching. As for the menu, it didn’t list all of the sandwiches and tea dainties we had, so, I can’t give the actual name of any of the tea offerings. I do know that there were two raisin scones for each of us, served with clotted cream and strawberry jam. For sandwiches, we had quiche, cucumber, salmon, and tuna. For fancies we were served a passion fruit cream puff, a miniature key lime pie, chocolate cake, and caramel and coffee mousse. All of the food was good, but my favorites were the quiche and salmon sandwiches, as well as the passion fruit and key lime fancies. I was a little disappointed in the tea selections, however. I assumed that, because we were located in Hong Kong, there would be a more robust selection of teas, perhaps even teas that would highlight Asian blends. Instead, the selections were limited, so I have to say the Chicago location wins in terms of tea selection. Besides the disappointing tea selection, the tea served as a mini get-away from the chaos that was finals week for my friends and me. The Peninsula is a more expensive afternoon tea, costing about $135 USD for three people, or $45 per person. I should note that Hong Kong isn’t known for being a service city, although the service at the Peninsula’s Hong Kong location was good, especially by Hong Kong standards. In Chicago, however, they are a little more attentive, pouring the tea for you when you’ve run out, and even adding a few bonus desserts to the tea. The Hong Kong location had a single bonus dessert, a really delicious chocolate truffle, whereas, in Chicago, the bonus is usually a bit more substantial, like a lava cake, or pot de crème. Also, because the Hong Kong location does serve tea in the actual Lobby, don’t expect a great view. The Peninsula Hong Kong is located across the street from the Hong Kong Space Museum, so all we could see through the window was a big dome for the Omni Theater. With so many other locations offering great views in Hong Kong, this was a bit of a disappointment. The Chicago location provides a city skyline view, so perhaps that is why I was surprised the Hong Kong location did not. Despite the small disappointments I’ve listed, Peninsula Hong Kong’s tea was well worth the line, and the food was actually more flavorful than my last visit to the Chicago Peninsula. 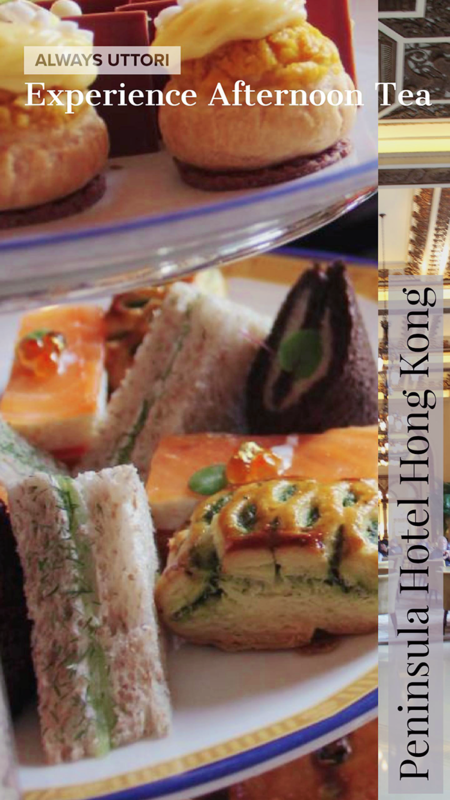 If in Hong Kong, or Chicago, give the Peninsula’s afternoon tea a try, you won’t be disappointed! And be open to trying other, not so British, tea styles such as Japanese tea ceremony, or even a cha chaan teng! Special thanks to Ashleigh Choi for helping with pictures.